Exam season is (finally) starting to wind down. Actually, I had an exam myself this week for an English Literature module I’ve been doing with the OU. As with many people, it’s been some years since I have handwritten anything more than a sentence intended for eyes other than my own. As I left the exam hall, with aching and inky fingers, I wondered why our methods of examination seem to be so disjointed, not only from the reality of everyday life but even from classroom experiences. A large proportion of students do the greater part of their revision on computers or tablets, if not their actual classwork. This has been the case for many years – even 10 years ago I wrote most of my school essays on the computer.The use of technology in the classroom is advancing in exciting directions and constantly developing – assessment (formative and summative), videos, simulations, showcasing of student work, iBooks, MOOC’s – the possibilities are endless. So, if students hardly handwrite in the classroom, I am not convinced of the purpose of examination through this means. If nothing else, a typed essay is significantly quicker and easier to mark. A typed submission also enables easy editing – no more angrily crossed out misspellings or arrows squiggling across pages to insert further thoughts, no bringing five pens, a pencil, two rulers and a calculator just in case. And won’t somebody please think of the trees? I am in no way against the value of handwriting, especially in Early Years. Handwriting has been demonstrated to assist in the development of fine motor skills, memory and other cognitive gains. Additionally, several studies have demonstrated higher levels of retention and comprehension when written notes are taken rather than typed notes. For recalling factual information, writing is a quick and easy way to solidify memories. So, for the sciences, handwriting may always have an important role, and not only because there is, to my knowledge, no quick way of noting equations digitally. However, for essay-heavy subjects such as English or Philosophy, where the emphasis is so much more subjective and interpretive, digital notes are quicker, easier and tick all the boxes. 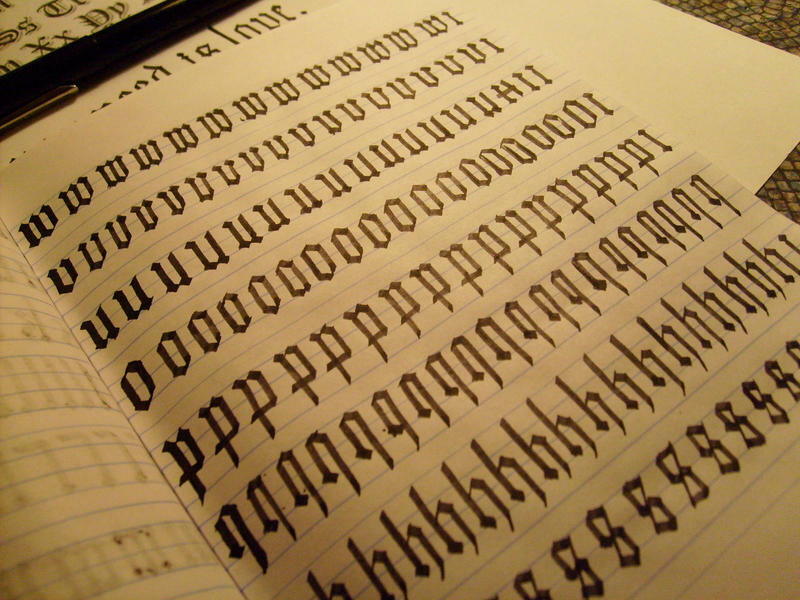 Nonetheless, penmanship is an art – my grandfather creates calligraphy that is beautiful to behold. Not only is it an art, but it has vital cultural connotations. Different scripts with different languages or even accentual details communicate cultural and community identities. So, yes, handwriting is something to be preserved and valued. If handwriting is an art, or is deemed culturally significant, perhaps a debate regarding its place in the curriculum is in order. However, it appears to me that we have two options – students continue to come out of exams in physical pain from the quantity of writing they have to do, or lose valuable lesson time teaching handwriting purely for the purposes of an arguably outdated form of examination. Not to mention the lost marks due to an indecipherable scrawl – some of the most able students are the most frustrating in terms of legibility. It is also worth noting that the recent headlines about the importance of handwriting were evidenced primarily by a survey conducted by BIC, with a clear vested interest in promoting the declining art. Exams are hugely stressful and demanding experiences for students, teachers and examiners already, without insisting on an increasing outmoded form of notation. Exams should reflect and assess what is going on in the classroom. Handwriting is no longer an automatic part of the learning process and its use in the examination process therefore must be re-evaluated.